“So Say We All” To J. & Mo. Edward James Olmos Shouts Out To J. & Mo. For years our good friends J. & Mo. have tried to get the LanceAround family to watch the new (2004 – 2009) Battlestar Galactica TV series. I wish we had listened to them. If we had, we would have better understood why some audience members at the Enzian Theatre kept shouting “SO SAY WE ALL” when Olmos appeared. J. & Mo., we might not understand how good Battlestar Galactica is, but we are going to get a copy of the DVD and find out. In the meantime, here’s a little gift for you. 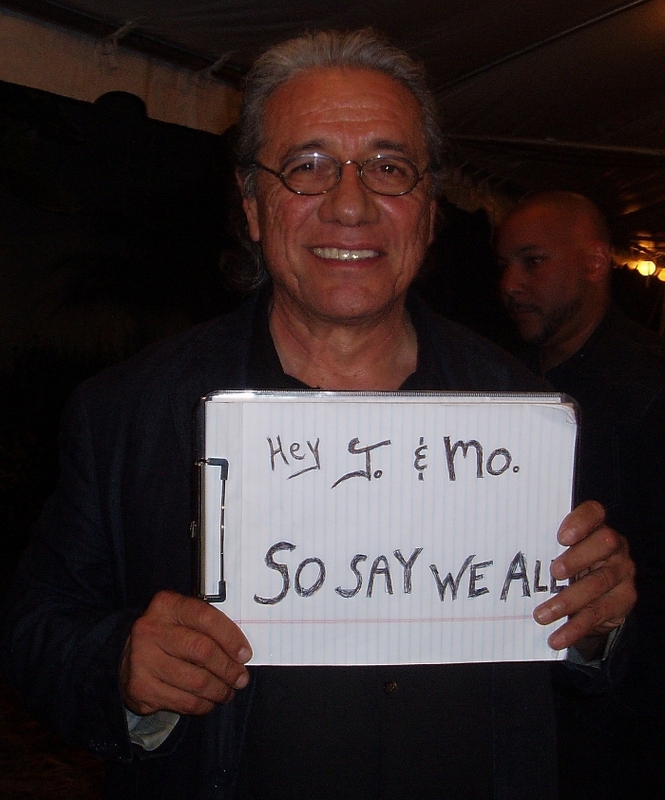 After LanceAround’s interview with Edward James Olmos, he agreed to give you a shout out by holding up a sign written specifically for you and pictured above. We hope you like it! This entry was posted on April 16, 2011 at 4:19 am and is filed under My Muses. You can follow any responses to this entry through the RSS 2.0 feed. You can leave a response, or trackback from your own site.